This week’s TAST stitch was very challenging indeed! It is so hard to refrain from embellishing with other stitches - but I will torture myself. As you can see from the preliminary drawings scribblings in the journal, it was a toss up between the pear idea and a willow tree. The pear won, and remarkably, it has turned out almost like the drawing – but in a different orientation. The background is quite puckery but I kind of like the added look of texture this gives it. I know, I know, Shirley, I should have used a hoop. Next time…………. The two applique pieces are very shiny gold fabric but it doesn’t show up well in the photograph. The sample is completely stitched in chain stitch using different weight threads and attaching braid and ribbon. I have stuffed the pear from the back with a little wadding. Not only does it make it a little 3 dimensional it got rid of a lot of puckers at the same time! This piece was fun to do. You must be very pleased with this interpretation of what you sketched. Love the colours and the padding does add a great 3 dimensional look. you keep coming up with good ideas for showing the stitches Di. I love chain stitch, you can do so much with it. Dianne, I love, love this. it is so beautiful and imaginative. I love the little golden patches of the pear and the colours of the whole little piece of art. I like your chain stich sampler. Great to see it come to life from a drawing. 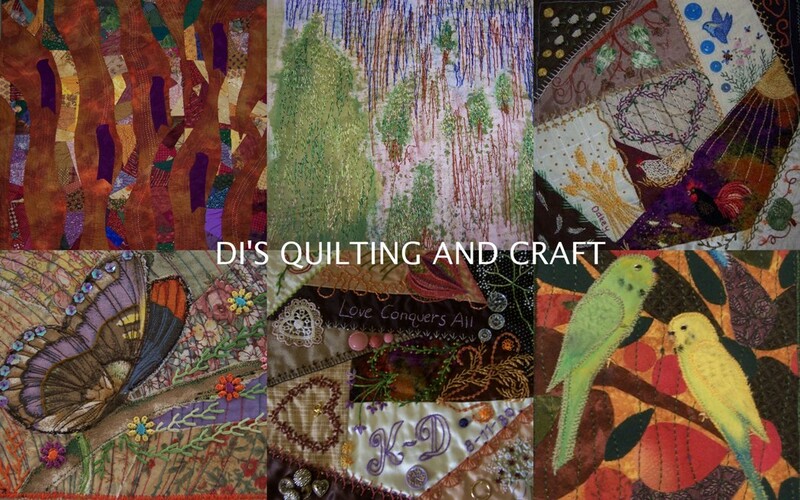 I am truly enjoying your stitch journey Dianne. This week's is no exception. Great way to use what I consider a rather boring stitch. The thread colours are absolutely beautiful. It is good to see the progress from sketch to finished item. I love the colours you have chosen.